I use Outlook for business and need to quickly find important email among the spam. The colorful circles distract from the Subject and short preview and make it difficult to pick out the important messages. Great app!! 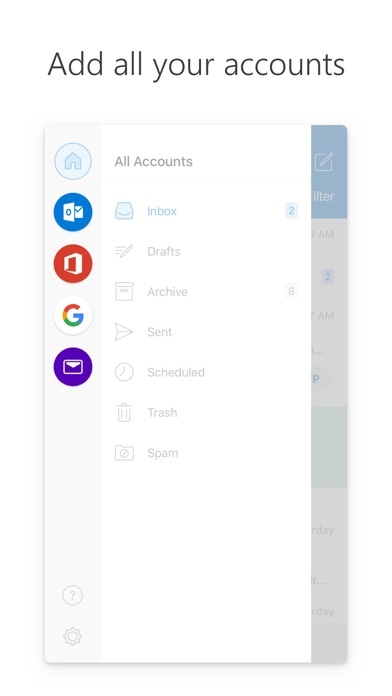 Only complaint that I would like to see updated is the ability to select multiple emails so they can be easily deleted and/or moved to another folder. It takes to long to go into each email and then move it or delete it. The app works perfectly. 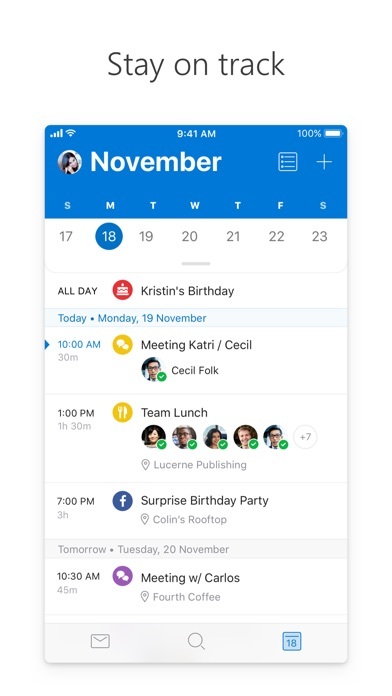 Only issue is when you schedule a meeting it does not show up right away. 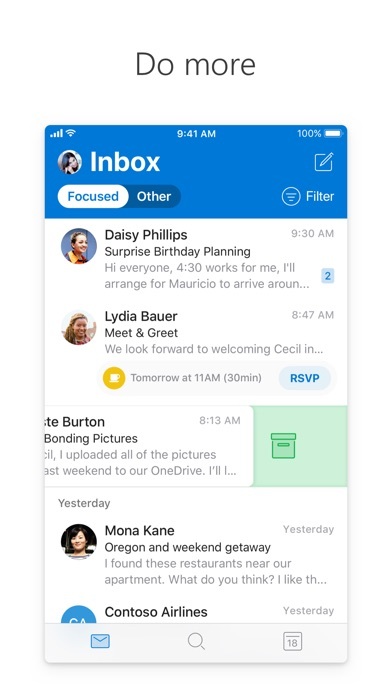 One request is to add contacts like the regular outlook. Great job on the updates! Finally Apple Watch Complication is working!!! Thanks for fixing this. Upgraded my rating. 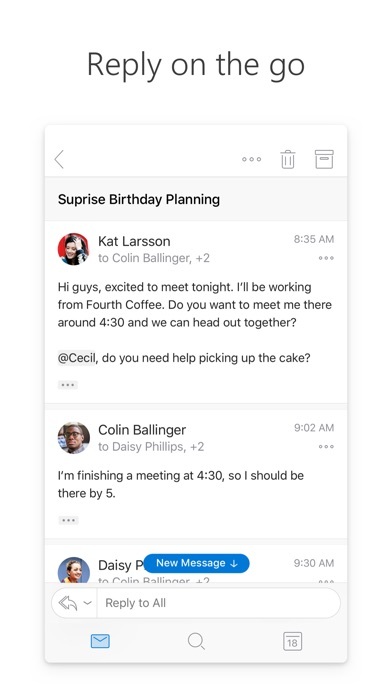 Now we need the ability to file emails between accounts. At least give us an option in the settings to turn them off.... it makes it so much less friendly to have a big circle (if not a picture) taking up space on my screen that could otherwise be used for something for more important. “Nothing” is more important than “profile picture”, trust me that many who uses email to communicate uses for serious stuff. Most recently they made it more difficult to tell if a message is read or not. That dot is not cutting it. Removing a couple of stars... the latest updates have removed a few design elements that make the app more difficult to use. The settings wheel is gone, for example. I don’t like the latest update that added contact photos. 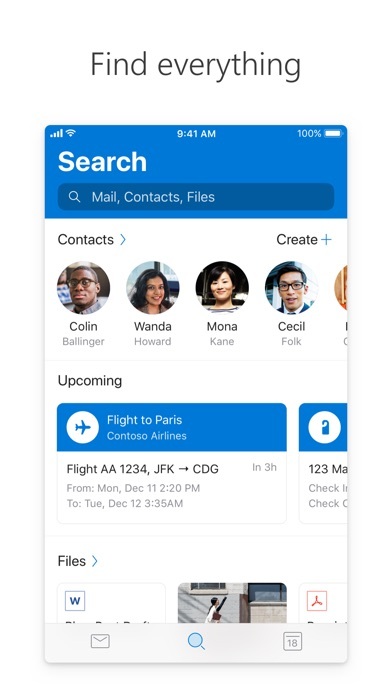 It’s such a pain in the rear to setup your contacts with contact photos, and that feature is really only supported when your contacts emailing you do so from another Outlook account. Since Outlook is far from the most popular email service, this is a useless feature. Thankfully I was able to turn it off. My screen real-estate was being clogged by useless two letters in a circle icon. It didn’t make finding emails any quicker either.